New Year is often a time when people wish for prosperity and new beginnings. 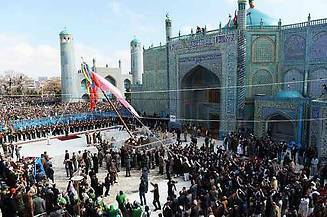 March 21 marks the start of the year in Afghanistan, Azerbaijan, India, Iran (Islamic Republic of), Iraq, Kazakhstan, Kyrgyzstan, Pakistan, Tajikistan, Turkey, Turkmenistan and Uzbekistan. All those country inscribed Nowruz in 2016 on the Representative List of the Intangible Cultural Heritage of Humanity. It is referred to as Nauryz, Navruz, Nawrouz, Nevruz, Nooruz, Novruz, Nowrouz or Nowruz meaning ‘new day’ when a variety of rituals, ceremonies and other cultural events take place for a period of about two weeks. An important tradition practised during this time is the gathering around ‘the Table’, decorated with objects that symbolize purity, brightness, livelihood and wealth, to enjoy a special meal with loved ones. New clothes are worn and visits made to relatives, particularly the elderly and neighbours. Gifts are exchanged, especially for children, featuring objects made by artisans. There are also street performances of music and dance, public rituals involving water and fire, traditional sports and the making of handicrafts. These practices support cultural diversity and tolerance and contribute to building community solidarity and peace. They are transmitted from older to younger generations through observation and participation.